Domain Thoroughbreds :: Off The Canvas! 9 months ago Skelton was down, and almost out. Up to 7 litres of fluid was drained from his chest cavity everyday for 8 days, vets held little hope of survival but the son of Excelebration toughed it out. 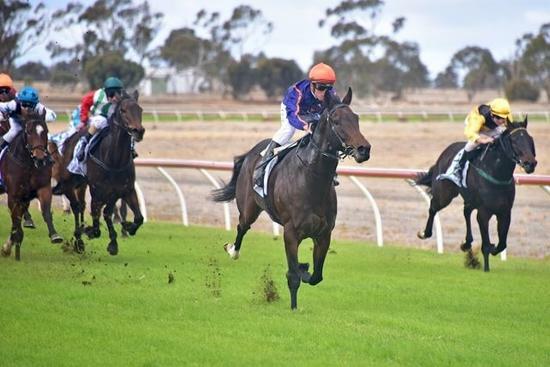 On debut at Donald over 1350m at Donald, SKELTON made light of every negative (first trip away, soft 6 track, 58.5kg, outside draw in a field of 13 mostly experienced rivals, and being very toey at the starting stalls) to float in, untouched, by 5 lengths. Tail streaming and ears pricked to the line, SKELTON clearly enjoyed his first outing and appears to have a bright future for Domain Thoroughbreds and a posse of owners. His impressive pedigree suggests more ground will be right up his alley. This fella has already proved he has courage, on Saturday he showed he has his fair share of ability too.